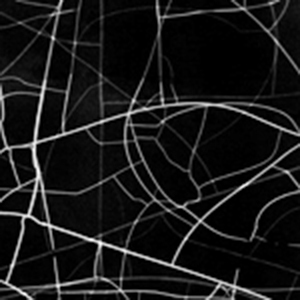 Dispersal Patterns, a collaborative project with John Kannenberg, has been accepted for a 2010 release on the London label Entr’acte. Footage shot during the recording sessions for Drawn, a new project with Glenn Bach, John Kannenberg, Jon Mueller, Jim Schoenecker and Jim Warchol. Recorded at Kenilworth Square East studios, Milwaukee, WI, 11 April 2009. John Kannenberg and I will perform solo and duo sets on Something Else, hosted by Philip von Zweck, Sunday, 18 May 2008, 10PM, WLUW 88.7 FM, Loyola University-Chicago. I performed an hour-long set with John Kannenberg on Free Radio SAIC, Friday, 11 April 2008, 4-5 PM (CST). Neighborhood Public Radio broadcast the performance into the Whitney Museum of American Art during the Whitney Biennial, as well as to other locations in NYC. The performance is now archived at Free Radio SAIC and will be available as a podcast through Free Radio SAIC and iTunes U.
John Kannenberg, Jim Schoenecker, Jim Warchol, and Seth Warren-Crow will join me for an open rehearsal and 3PM performance in conjunction with the KSE Open House, Saturday, 19 April 2008, 12 noon to 5PM, KSE 449, Kenilworth Square East, 1925 E Kenilworth Pl., Milwaukee, WI 53202. 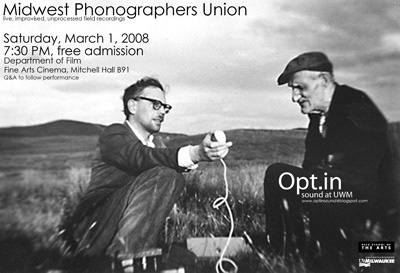 The Midwest Phonographers Union will be performing for the the premiere night of Opt.in, a new series of Sound events at UWM, Saturday, 1 March 2008, 7:30 PM, UWM Mitchell Hall, Room B91. Participants include Glenn Bach, Chris Delaurenti, Dale Kaminski, John Kannenberg, and others TBA.